Larry Mace’s soldier son was buried Monday at Arlington National Cemetery with full military honors, one of eight U.S. troops killed earlier this month in Kamdesh when several hundred militant fighters armed with automatic rifles and rocket-propelled grenades stormed their base, known as Combat Outpost Keating. 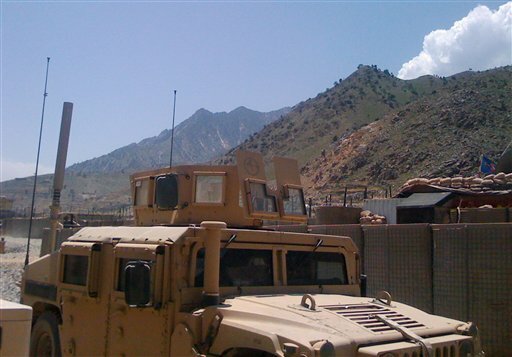 The attack at Kamdesh, along with a similarly costly battle a year earlier in nearby Wanat, have emerged as powerful symbols of the challenges the Obama administration faces as the war in Afghanistan enters its ninth year. Without more troops and firepower, the Taliban-led insurgency will grow stronger. But devoting more people and equipment risks an open-ended commitment to a war increasingly unpopular with the American public. American commanders didn’t reinforce Keating or pull the troops that were there out in time, Larry Mace said. Led by an Army band, Stephan Mace’s flag-draped casket was borne to the grave site on a horse-drawn caisson. Under blue skies with a cool wind blowing, he was remembered as an all-American boy from rural Virginia who answered his country’s call to duty. After three rifle volleys by a firing party, a bugler played Taps. A bagpiper followed with Amazing Grace. More than a year before the firefight at Kamdesh, nine U.S. soldiers were killed and 27 more were wounded when their base at Wanat, a village about 30 miles from Kamdesh, was nearly overrun by insurgents. Following the Oct. 3 battle that killed Stephan Mace, U.S. forces left Keating and another outpost at Kamdesh. The withdrawal had been planned before the attack had occurred, according to the NATO-led coalition. A spokesman said the shift was part of a new strategy outlined months ago by the top U.S. commander in Afghanistan, Gen. Stanley McChrystal, to shut down difficult-to-defend outposts and redirect forces toward larger population areas to protect more civilians. Even as his son was being remembered as a hero, Larry Mace remains angered by the circumstances surrounding his son’s death. Stephan was home in August on two weeks leave. Sitting in the living room of their home in Winchester, Va., Mace said Stephan told him the Taliban were massing in Kamdesh. Yet strict rules of engagement kept the soldiers from taking aggressive action to prevent an attack, Larry Mace said. Mace recalled that Stephan gave his dog tags to his brother Brad before returning. “I think he knew he wasn’t coming back,” Larry Mace said. Born in Falls Church, Va., Stephan Mace was the second-eldest of four brothers. He joined the Army in January 2008. Mace was made a “19 Delta,” Army parlance for a cavalry scout, and assigned to the 4th Brigade Combat Team at Fort Carson, Colo. He was sent to Afghanistan in early 2009. When he was home just a few weeks ago, Stephan anguished over returning to Keating, his father said. Dedicated to his unit, there was no doubt he would go back. But he was weighed down by worries the base was vulnerable to an onslaught he felt sure was coming, according to Larry Mace. Photos that Stephan Mace took in May of Outpost Keating showed a base located on low ground, surrounded by craggy outcroppings that made ideal hiding spots for enemy fighters. His father had also noticed a physical change in his son. He’d lost about 20 pounds from his 185-pound frame, a combination of the rigors of military life and the stress of being on the front lines. Larry Mace had planned a fishing trip with Stephan, who alternated between the Mace home and staying with old high school friends while on leave. But on the day of the outing, Stephan didn’t show. Larry Mace didn’t see his son before he left. In text messages they later exchanged, Stephan asked his father to forgive him. “Of course I did,” Larry Mace said. Is this a sickness within the American military? Take a look once more at the Wanat video linked in a previous article. Now recall a comment left by Slab at Analysis of the Battle of Wanat. We know that the Taliban are going to conduct mass assaults against our positions. We know that they want the advantage terrain offers them. Yet we continue to emplace Combat Outposts manned by platoon-size U.S. forces in the absolute worst locations imaginable from the perspective of terrain. The … worst … locations … imaginable. Really. What gives? Is this a sickness within the American military? McChrystal’s position, i.e., deploying the troops in population centers, obviously neglects the countryside in a tip of the hat to the (utterly failed) Soviet model. But the answer to failed combat outposts in poor terrain is not to withdraw. It’s to position the outposts on favorable terrain for force protection and garrison them with the right number of troops. Andrew Exum blogging at Abu Muqawama has a piece up on who he perceives to be the winner and losers in Tom Ricks’ new book The Gamble: General David Petraeus and the American Military Adventure in Iraq, 2006-2008. I personally like Andrew and have enjoyed the exchanges I have had with him, via e-mail and in blog articles. But let’s deal with a few items from this post by Andrew. Well, do tell. Actually, I judge the performance of books that promulgate myths to be poor. I have not read the book because Tom hasn’t sent me a free copy to review. Had he sent me a copy I would have responded. As a matter of fact, I haven’t even been able to get Tom to respond to a single e-mail. But if Tom’s book advocates the idea that the campaign was won by jettisoning the notion of FOB-centric counterinsurgency and embracing Combat Outposts (or Joint Security Stations), then it is an exercise in simplistic myth-telling. We have dealt with this before, this notion of a simple, one line narrative for Iraq. The country, the security situation, the units, the commanders, and the enemy was simply too diverse for a one-size-fits-all narrative. Even as late as the middle of 2007 operations were conducted in Fallujah, Anbar that were essentially FOB-centric. The Marines in Operation Alljah would spend some time at JSS, but rotate in and out of them, never spending more than about two or three weeks per rotation. The FOB was the main strategy for force protection, and yet the Marines still spent most of their time interacting with the population no matter where they garrisoned (heavy census operations, heavy patrolling, and especially heavy kinetic operations). These operations were so successful that many high level visitors were received to discuss the methods, including the Commandant of the Marine Corps. To say that a commander is FOB-centric is to say nothing more than he is committed to force protection. It means nothing regarding the ability to do counterinsurgency. And so now we have let the cat out of the bag, haven’t we? There it is. The great myth. Now, let’s distinguish between levels. Currently much of the Army in Afghanistan is cloistered into huge FOBs and left without much contact with the population. Let’s contrast that the right way to do it. In Opening a Combat Outpost for Business, we listened as the Marines built their force protection. Marines with 2nd Platoon, Motor Transportation Company, Combat Logistics Battalion 3, conducted multiple combat logistics patrols in support of Operation Gateway III in Farah Province, Islamic Republic of Afghanistan Dec. 28, 2008, through Jan. 25, 2009. The logistics combat element Marines, part of Special Purpose Marine Air Ground Task Force – Afghanistan, endured more than two weeks behind their steering wheels and gun turrets in improvised explosive device-laden terrain during the initial phases of the operation. Military planners with SPMAGTF-A designed Operation Gateway III as a deliberate plan to clear southern Afghanistan’s Route 515 of any existing IED and insurgent threats on the important east-west route. The combat logisticians directly supported 3rd Battalion, 8th Marine Regiment (Reinforced), the ground combat element of SPMAGTF-A, with the essential supplies and construction support necessary to erect three combat outposts at strategic locations along Route 515. In a limited amount of time, the three locations were successfully developed from barren land into safe havens for the 3/8 Marines occupying the area. Ross also said the timing and coordination required to conduct the operation came together well. 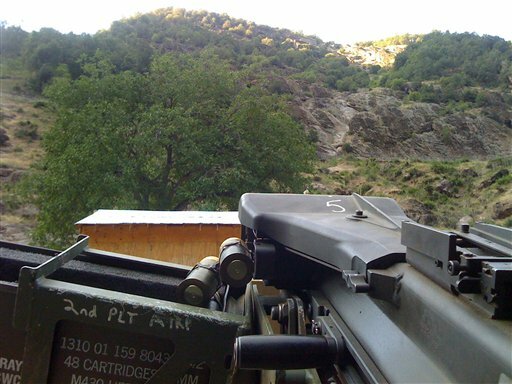 Second Lt. Juliann C. Naughton, 2nd Platoon’s convoy commander, explained it’s shocking for the locals to wake up the next morning to see that a military outpost has appeared from nowhere during the course of the night. Fortifications including concertina wire, a parapet several feet tall and dirt-filled protective barriers ensured the Marines on the interior of the COPs were shielded from outside threats. Multiple observation posts and several heavy and medium machine guns provided security and over-watch for the combat logisticians as they performed their craft. The interior of the COPs offer living quarters, hygiene facilities, combat operations centers and more to accommodate its current and future residents. The posts were strategically placed along the route to show an alliance presence, as well as enable safe travel. And thus can it be done successfully, this notion of force protection combined with contact with the population. To set them in juxtaposition as opposites or somehow mutually exclusive is the grand myth around which the narrative of the surge is being built. In reality, the situation was more complicated, a subject we covered in The Surge. OK, you were not saying that Gentile was the next Galula, that they were on the way to winning the war by themselves. But clearly your impression was positive, at least the way you portrayed us in Fiasco. Then The Gamble comes along and in it you become a harsh critic of my unit’s performance (and that criticism was based on the same embed tour that you did with us in early February). So what changed between the two books? A small civil war, and the prospect of defeat. So there you have it. One may ask rhetorically what this has to do with Gian Gentile, and the obvious answer is nothing whatsoever. So we may conclude that Tom doesn’t have a good answer for what happened between the two books. Third, as for Gian, he and I have slightly disagreed and nuanced our arguments to come to agreement elsewhere, such as with Sadr (I believe that marginalization of his forces did him in, and that he wouldn’t have been alive anyway had the 3/2 Marines had their way, as he was under their custody in 2004) and the Sons of Iraq and pay to participate (which saw robust use in the Anbar province in 2007 as it should have). But Gian is a great American and a warrior-scholar, and to place him in the category of “loser” as Andrew does is simply bad form. There is no excuse for it. Again, I like Andrew, but he seems to have bought into the Gnostic version of counterinsurgency. Only a few “get it,” and the rest of us should simply be consigned to the doofus category in counterinsurgency. Such may be the indiscretions of youth. “For waging war you need guidance, and for victory many advisers” (Proverbs 24:6, NIV). In our Analysis of the Battle of Wanat we pointed out that the protracted time to negotiate the presence of a combat outpost at Wanat (or rather, a Vehicle Patrol Base) in part led to the costliness of the battle. The meetings with tribal and governmental officials to procure territory for VPB Wanat went on for about one year, and one elder privately said to U.S. Army officers that given the inherent appearance of tribal agreement with the outpost, it would be best if the Army simply constructed the base without interaction with the tribes. As it turns out, the protracted negotiations allowed AAF (anti-Afghan forces, in this case an acronym for Taliban, including some Tehrik-i-Taliban) to plan and stage a complex attack well in advance of turning the first shovel full of sand to fill HESCO barriers. A contrasting picture is drawn for us in the Farah Province by the U.S. Marines. Here at The Captain’s Journal we have a thing for logistics, and this example shows the greatness of great logistics and logisticians. But ultimately what we want to draw out of this example is not just about logistics, or interservice rivalries and how the Marines might teach the Army a thing or two. That really isn’t the point. In the example of Wanat, the VPB wasn’t hopscotched into the Wanat valley in relatively close proximity to other outposts, and force protection seemed to be a secondary or even tertiary issue. Rather, the construction of the VPB was started only after one year of negotiations with tribal elders, negotiations that the elders didn’t really want. In the more recent example cited above, the population was engaged after construction of the COP. The population doesn’t get to decide if counterinsurgency is going to be practiced in their area, or if a COP is going to be constructed near their home. They only get to decide if they are going to participate with the Marines in securing the area. Finally, they don’t get to hear about it for one year before it happens. In fact, they don’t get to hear about it at all. Two perspectives, two different theories on how to open a combat outpost for business. The Captain’s Journal disagrees with the former example and concurs with the later.